Non-alcoholic Steatohepatitis (NASH) is a degenerative form of non-alcoholic fatty liver disease (NAFLD) that leads to damage and inflammation over time. The unwanted fat deposition in liver is the main cause of this disease. If left untreated or undiagnosed, it can lead to liver cirrhosis and eventually progress to liver failure. The high prevalence of liver-related diseases has coaxed several industry players and research institutes to invest in development of sophisticated NASH diagnostic and therapeutic products. Owing to these reasons, the global NASH biomarkers is expected to reach a valuation of US$1.7 bn by the end of 2024 from US$201.2 mn in 2016. During the forecast period of 2016 and 2024, the global market is estimated to progress at a CAGR of 31.7%. Currently, histopathology using a liver biopsy which is an invasive method, imaging techniques like magnetic resonance imaging (MRI), transient Elastography (TE), ultrasound, etc., and in vitro diagnostic techniques using some biomarkers are used for diagnosing and monitoring NASH. However, the introduction of biomarkers has given the patients the option of non-invasive methods for understanding the stage and development of the disease. This precise factor is estimated to boost the market’s growth in the coming years. Analysts anticipate that the global market will also be driven by the huge untapped need for diagnosing NASH. Furthermore, the growing number of type 2 diabetics are also expected to augment the demand for NASH biomarkers as they are prone to liver-related diseases. Changing lifestyles and improving healthcare expenditure is also likely to make a significant difference to the soaring revenue of the overall market. On the basis of type, the global NASH biomarkers market is segmented into serum biomarkers, hepatic fibrosis biomarkers, apoptosis biomarkers, and oxidative stress biomarkers. Of these, serum biomarkers and hepatic biomarkers are extensively used in the medical field. The serum biomarkers are expected to lead the global market due to ability to deliver efficient results. Apoptosis markers follow this lead closely. In terms of end users, the global NASH biomarkers market is segmented into CRO and pharmaceutical industries, academic research institutes, hospitals, and diagnostic laboratories. The report suggests that hospitals and diagnostic laboratories are likely to dominate the global market in the coming years. The increasing demand for non-invasive NASH diagnostic and monitoring tools in the ongoing trials by CRO and pharmaceutical manufacturers are expected to boost the share of the respective segment over the forecast period as well. In terms of geography, the global NASH biomarkers market is segmented into North America, Europe, Asia Pacific, Latin America, and the Middle East and Africa. Presently, Europe leads the pack due to the strong presence of players in the region. The report states that Europe will continue to dominate the global market due to the increasing pool of population suffering from NAFLD and NASH. Over the same period, North America will also show steady demand for NASH biomarkers due to its well-established healthcare industry and a huge population base. The key players operating in the global NASH biomarkers market are Genfit SA, One Way Liver S.L., BioPredictive S.A.S, Siemens Heathcare Pvt. Ltd. (now Siemens Healthineers), Exalenz Biosciences Ltd., Prometheus Laboratories Corp. (part of Nestle Health Sciences), Quest Diagnostic Incorporated, and SNIBE diagnostics. Non-alcoholic steatohepatitis (NASH) is liver disease which is categorized under the spectrum of non-alcoholic fatty liver disease (NAFLD). NASH is an advanced form of NAFLD where the liver inflammation occurs owing to fat deposition in liver. The fat accumulation may be induced by genetic abnormalities, metabolic dysfunction, drug induced damages, etc. Untreated and advanced NASH is one of the major reason for liver cirrhosis and sever liver damage such as liver failure. Presently three distinct method are used for diagnosis and monitoring of NASH, those are biopsy derived histopathology, imaging tools like transient elastography (TE), magnetic resonance imaging (MRI), etc., and in vitro diagnostic using biomarkers. As per the World Gastroenterology Organization It is estimated that around 20% to 30% of world population is affected with NAFLD. Increasing prevalence of NASH associated conditions like obesity and diabetes are expected to drive the growth of NASH biomarkers market. According to Deutsche Bank around 45 million people are anticipated to be affected by NASH in the U.S. and EU5 countries by 2025. Also there are many industry players investing on development of NASH therapeutic drugs, and most of them are in phase II or III of clinical trials. Their requirement of non-invasive diagnostic tools for monitoring their drug effectiveness is expected to drive the growth for NASH biomarkers market over the forecasted period. Biomarkers based NASH diagnostic tests are proposed to be at lower cost and non-invasive which is expected to make them a preferred tool for NASH diagnosis over invasive liver biopsy and costly imaging techniques. Ongoing research in discovery and development of novel NASH biomarkers is expected to drive the growth of NASH biomarkers market. However presently available NASH biomarkers are less accurate and have little efficacy which makes their usage limited. Also their results are overlapping with other metabolic disorders which is anticipated to restrain the growth of NASH biomarkers market. 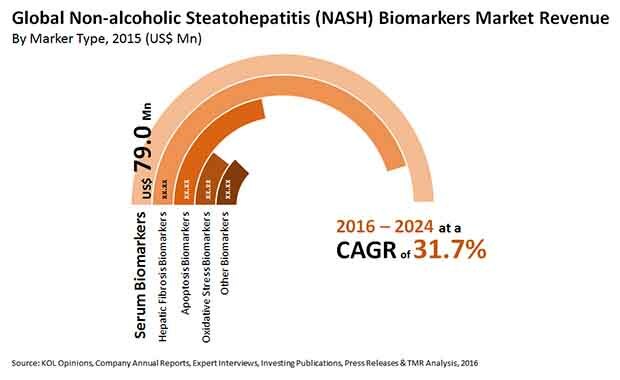 Based on the marker type the global non-alcoholic steatohepatitis biomarkers market is segmented in to five segments viz. serum biomarkers, hepatic fibrosis biomarkers, apoptosis biomarkers, oxidative stress biomarkers, and others. Serum biomarkers are expected to dominate the global NASH biomarkers market in the first half of the forecasted period. Owing to their indirect relation with NASH and other limitations they are expected to lose their market share in the second half of forecasted period. The Hepatic fibrosis markers are expected to grow exponentially over the forecasted period owing to their more accuracy and efficacy. This marker type segment is expected to hold the largest share of NASH biomarkers market by 2024. With expected launch of new diagnostic tools by Genfit SA and Exalenz Biosciences Ltd. the other markers segment is expected to have an exponential growth over the forecasted period. Based on end-user, the global non-alcoholic steatohepatitis biomarkers market has been segmented into contract research organization (CRO) & pharmaceutical industry, academic research institutes, hospitals, and diagnostic laboratories. Owing to the requirement of non-invasive diagnostic tools for routine monitoring of drug therapy effectiveness during the clinical trial of drug candidates, the CRO & pharmaceutical industry end-user segment is expected to have a moderate growth over the forecasted period. However towards the end of forecasted period this segment is expected to be superseded by hospital and diagnostic laboratories end-user segment. With expected launch of companion diagnostic tests along with NASH therapeutic drugs the hospitals and diagnostic laboratories segments of end-user are expected to witness an exponential growth over forecasted period. The hospital end-user segment is expected to grow at CAGR of 36.6% while diagnostic laboratories segment is expected to grow at CAGR of 37.0% over the forecasted period. Geographically, the non-alcoholic steatohepatitis biomarkers market has been segmented into five regions: North America, Latin America, Europe, Asia Pacific and Middle East and Africa. These regions have been further segmented by marker type and end-user segments. The competition matrix section included in the report is likely to assist the existing players to increase their market shares and new companies to establish their presence in the global non-alcoholic steatohepatitis biomarkers market. The report also profiles major players in the market based on various attributes such as company overview, financial overview, SWOT analysis, key business strategies, product portfolio, and recent developments. Key companies profiled in the report include One Way Liver S.L., BioPredictive S.A.S, Siemens Heathcare Pvt. Ltd. (now Siemens Healthineers), Genfit SA, Exalenz Biosciences Ltd., Quest Diagnostic Incorporated, Prometheus Laboratories Corp. (part of Nestle Health Sciences) and SNIBE diagnostics.